You’re busy and have a million daily chores to see to so why not take at least one thing off the list and automate your calf feeding? The Lely Calm automatic calf feeder will supply the correct portion and concentration of feed spread over the day, resembling the natural behavior of the calf. The accurate and small portions spread over the day will substantially enhance the development of the digestive system of the calf. Calves are weaned gently by gradually reducing their milk portions. Slowly reducing the milk yield will ensure that the calves automatically increase their intake of roughage. The calves are prepared from the beginning for a milk producing life with a milking robot. From a young age, calves are raised knowing to get their milk; this makes them assertive. They also become accustomed to automatic feeders and the noises they make. Knigge Farms, located in Omro, WI, is owned and operated by Pete and Theo Knigge, their son, Charlie and his son, Jacob and employs the use of automatic calf feeders. Their family operation includes 600 acres of cropland, 120 milking cows and 150 young stock with 30 calves on milk. 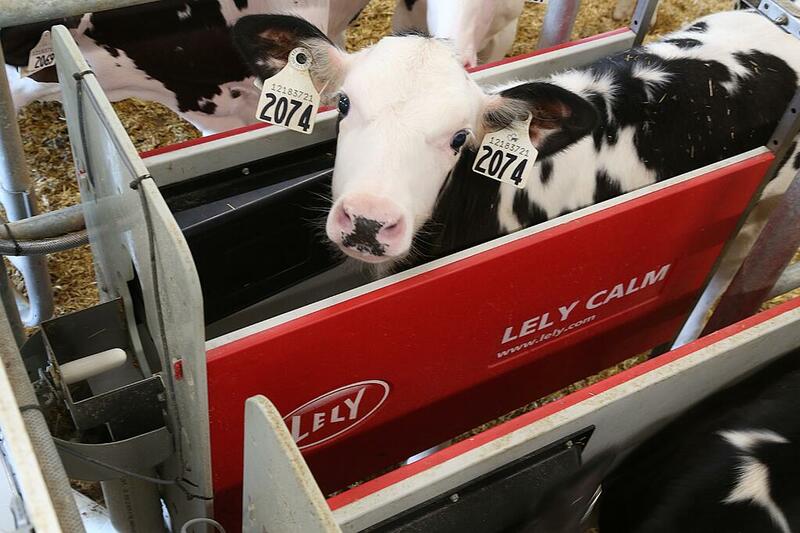 The family made the switch to automation by implementing a Lely Calm automatic calf feeder with two stalls. In the five years the automatic calf feeder has been in use, improved health has been the number one benefit to calves on the farm. By providing the right quality of milk at the right temperature several times a day, the Lely Calm promotes good health and, bonus for you, offers significant savings. It can provide 25 to 30 calves with fresh milk or milk powder, equal to precisely what they need to grow and develop into strong and healthy cows. The automated calf feeder also takes away the manual labor by always having the right amount of milk ready at the right temperature. Cleaning is another task that you can take off your chore list as it will clean itself automatically, accurately and on time for good hygiene. The ability to wean calves easily and gradually gives the calf time to eat more feed and develop their rumens, making them grow faster into strong and healthy ruminants. With a simple push of the button you can see how much milk a specific calf is consuming and adjust their mix if necessary. Furthermore, with the Lely Calm app, you will have the ability to check data on your calves remotely and intervene in the event of an alarm.